Despite some adverse weather conditions last weekend the BT West Division 1 match between Newton Stewart RFC and Kilmarnock RFC went ahead at Bladnoch Park. The ground was wet and the rain kept falling throughout the game, however the home support were in good spirits and the soggy conditions did nothing to dampen them. Newton Stewart were determined to find their winning form again after their loss away to Glasgow Accies a fortnight previously. The home team were playing with the strong winds behind them in the first half and looked to use this to their advantage. Almost immediately after kick-off the Reds set about their task, gathering the ball in their own half and running unchecked through the Kilmarnock defence before captain William McCornick scored the first try of the day. Stand-off Jamie Muir duly added the conversion. The tone was set for the game now and for the bulk of the first half Kilmarnock were at the mercy of a clinical Newton Stewart team who simply outplayed their opposition. Some impressive ball-handling, particularly given the inclement weather, allowed the Reds to move the ball out wide quickly. Coupled with some strong running, the tries began to come thick and fast. Backs David Sommerville, Robbie McCornick, Stuart McAllister and Tyrell Wilson, and back row David Montgomery all scored first half tries, with conversions following for two of them courtesy of Jamie Muir, whose work was cut out for him with the extreme winds. Kilmarnock had little possession to speak of and were visibly frustrated by the slippy ground conditions. Both teams were playing on the same pitch however, and it is testament to the abilities of the home team that they were able to produce such well-worked rugby in the circumstances. The half time break saw a brief discussion take place between the coaching staff from both teams and the referee on whether to continue with the game. 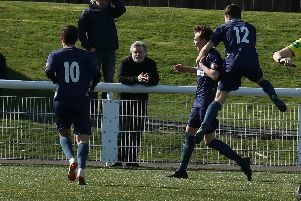 With the scoreline sitting at 36-0 to Newton Stewart the home team were enjoying the game more than their visitors, but everyone eventually agreed to proceed and the game went on. Playing into the wind in the second half slowed, but didn’t stop, the onslaught from Newton Stewart. Kilmarnock were able to use the wind to their favour now and put some pressure on the Newton Stewart line intermittently. Resilient defence from the Reds kept their opponents at bay however and as they continued running incisive lines on the counterattack the points tally grew further. Scrum half Robbie McCornick got a second try in this half, as did David Montgomery, while James Wallace and Graeme McMillan got their names on the scoresheet too. The final score was 58-0 to Newton Stewart. This was another impressive victory for the Reds and was probably their best display of ball handling so far this season. The team continue to grow in confidence and spirit as the season progresses and they will take this enthusiasm on the road to Lenzie on Saturday 12th Dec for their next league game. Man of the Match this week was scrum half Robbie McCornick for his excellent game management, slick ball handling in terrible conditions and scoring two good tries in the process.